My family LOVES fresh Blackberries, which we pick abundantly whenever we visit Washington State I might add…. And what better way to use all those fresh berries than cook them up in a yummy 5 Minute Blackberry Cobbler. 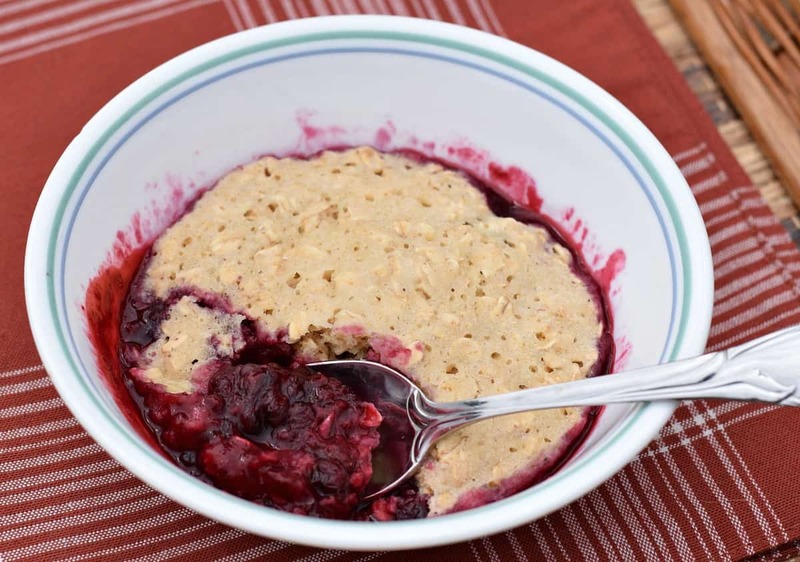 This 5 Minute Blackberry Cobbler is a single serving recipe, completely fat free and Vegan, perfect for those days you want a sweet and healthy treat. I use freshly picked Blackberries with a little sugar and corn starch for my filling. And add an Oatmeal/Brown Sugar Topping that will soon have you making seconds when the hubby or wife sneaks in to investigate the heavenly smells coming out of the kitchen. Trust me on this….I’ve made 3 of these already …. This recipe is similar to my Chocolate Mug Cake and Blueberry Muffin Mug Cake in that the entire dish can be made in a coffee mug or small bowl in just a few minutes in your microwave. Warm, sweet berries, with a chewy, oatmeal crumb. Mmmm mmmm the perfect treat. If your berries are frozen, heat ½ cup of frozen blackberries in a microwave safe bowl or cup until thawed, then add 2 tsp of sugar and ½ tsp of cornstarch and microwave for 30 seconds. With a slotted spoon, remove the berries and place them in the bottom of a microwaveable coffee mug or small bowl. You can either discard the juice left behind or pour it on top of your cobbler when it’s finished. Meanwhile in a separate bowl, mix 3 Tbs of Rolled Oats, 1 Tbs Flour, 1 tsp Brown Sugar, ¼ tsp Baking Powder, and a pinch of salt until well blended. Then stir in 2 tsp unsweetened Applesauce and 2 Tbs unsweetened Almond Milk to make a thick batter. Spoon the batter mixture over the top of the berries and microwave for 1 minute. Check the topping to make sure it’s done – you may need to microwave an additional 30 – 60 seconds, depending on the wattage of your oven. I hope you enjoy this treat, straight from the heart of the Pacific Northwest. Blackberries are truly a superfood, noted for their high levels of dietary fiber, vitamin C, vitamin K, folic acid and manganese. Blackberries are also considered one of the strongest antioxidant foods consumed in the U.S. 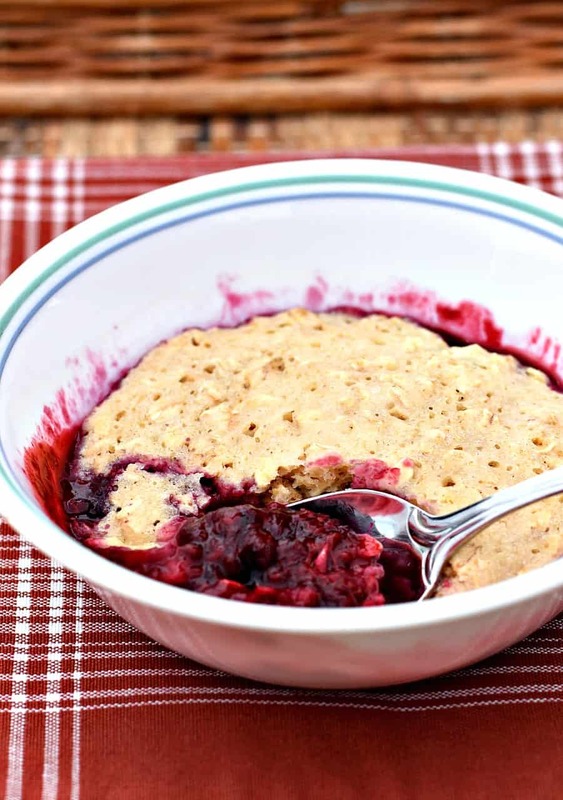 This 5 minute Blackberry Cobbler is the PERFCT way to get a quick, easy, healthy treat. Freshly picked blackberries topped with a sweet Oatmeal Crumb. In a microwave safe cup or bowl, heat berries, sugar, and cornstarch for 30 seconds. Pour off any liquid if desired or save to put on top of the cobbler when it's done. In a separate bowl, mix remaining ingredients to make a batter. Spoon batter on top of berries and microwave 1 minute. Check topping for doneness and microwave an additional 30 - 60 seconds if needed. I think I’ll try this with frozen cherries and add a dash of almond extract. Yummy! Thank you for creating this recipe…it was delicious! Great recipe! I used blueberries, because I did not have blackberries, and I added a teaspoon of lemon juice to the blueberries. I love it and will definately make it again. I don’t like using a microwave. How could I make this in the oven? Can you answer the oven question please? I too don’t like using the microwave, infact I don;t even have one anymore. I’ve never made this in the oven, so I really can’t tell you. Do you have the ingredient amounts to make in a casserole dish for a crowd? Looks wonderful! Can’t wait to try it. I’m sorry I don’t. I have never made it into a casserole! I LOVE that it’s QUICK to make. Thank you! Made this last night. Cinchy and Delicious!